Over its growing season, pink muhly grass (Muhlenbergia capillaris) transforms from a nondescript clump of greenery into an ethereal, pink masterpiece. The foliage doesn't actually turn pink, but the plant gets its color from the fluffy flowers that are borne on its stems. In U.S. Department of Agriculture plant hardiness zones 5 through 9, pink muhly grass is an adaptable plant that requires minimal care. Few plants have the drought tolerance of native grasses. 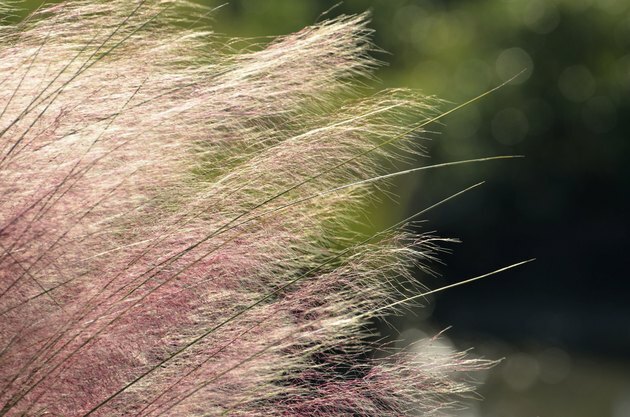 As a North American native, pink muhly grass rises to the challenge at both ends of the watering spectrum -- it performs equally well in times of drought or flooding. Although it tolerates flooding, it requires little water to live. After its first year, when it grows best in evenly moist, well-draining soil, pink muhly grass needs only infrequent watering. Optimally, 1 inch of water per week is enough for ornamental grasses. When the soil becomes almost dry 2 inches below the surface, water pink muhly grass to a depth of 1 inch. Sharing a characteristic of other ornamental grasses, pink muhly grass needs minimal fertilizer. If soil fertility levels are high, particularly the nitrogen content, pink muhly grass does not thrive. A high nitrogen level may promote disease, spindly growth and weakened stems. When growth begins in the spring, fertilize pink muhly grass with 1/4 cup of 10-10-10 fertilizer per plant. Water the fertilizer in around the plants. You can eliminate the guesswork of fertilizer needs by doing a soil test and following the recommendations. Pink muhly grass puts on a spectacular display when it blooms in fall. Resist the temptation to tidy up plants by pruning them after they flower. By allowing the dried flower stems to stay on the plant throughout the winter, you can enjoy the winter interest while providing shelter for wildlife. In late winter, trim the grassy clumps to 6 inches before the new spring growth forms. Disinfect pruning tools by soaking them for 5 minutes in a mixture of 1 part bleach and 3 parts water or in 1 part pine oil cleaner to 3 parts water. Rinse the tools with water, or let them air dry before using. Pink muhly grass counts pest and disease resistance among its appealing traits. Its susceptibility to disease increases typically because of excessive fertilization instead of a vulnerability to its natural environment. It is virtually pest- and disease-free, and deer don't like to eat it. As a low-maintenance plant, pink muhly grass is suitable for gardens with poor soil, low fertility and minimal rainfall. Its long-term health is better when planted in the spring to allow it enough time to establish itself before winter.